For many years now my full scale sim have been standing in a pile of boxes waiting for space enough to be built. I've realized this is not gonna happen in the near future. I'm even thinking about selling the stuff. However, I'm now tired of waiting and decided to build a desktop sim of the 737 so I can be in this hobby which I love and also have something flyable until I have the space for the full scale. 1. Inexpensive. All full scale Sims gets really expensive and this one cannot be expensive, it should be a shorter project where funds must not be holding me back from getting further. 2. Easily removed from desk and easy to reinstall when it's time to go flying. Maximum 10 minutes of work to get everything setup. 3. Not take to much space. It shall easily be stored in the office (2.5x2m) without taking over the room. It shall still be an office too. 5. Cheap software. Software can be very expensive. I don't now how many dollars I've put into p3d Addons. Im not going for a complete suite to save money. 1. I'll use as much hardware I already have for my full scale. I'll make everything I can myself. Use my 3d printer as much as possible even if it means it looks a bit more ugly than purchasing expensive hardware. 2. 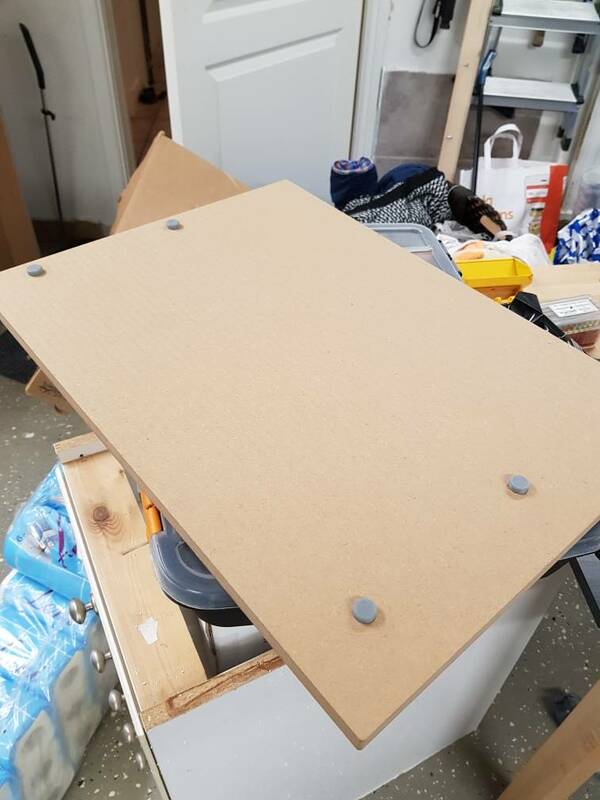 I've not completely decided if I should go for a small stand that can be attached to the desk or if I should go with a box that you put on the desk. However the important thing is that it's easy to move and put a side. 3. Nothing will be scale. PFD and ND will be approx 90% scale because they are important. 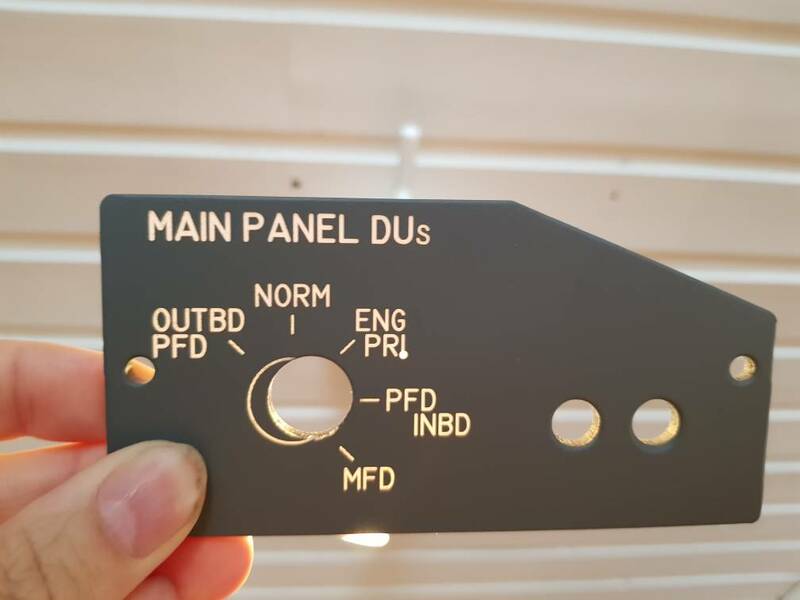 All panels is designed by me with inspiration from 737 but they are simplified and switches I don't need between engine start and shutdown are removed. 4. With the official Normal checklist as reference and my experience from my MCC course in 737 I've designed a "MIP" including both MIP and OVHD switches and panels used during normal work flow from eng start to shutdown. Let me know if you think I've missed one. Remember I don't take non normal procedures into account. 5. X-plane! I'm not gonna purchase prosim, I'm gonna use Zibo 737 and Arduino or teensy for interface to keep the costs down and actually I love the Zibo 737 and x-plane. I'll focus on the MIP now and later on I'll build a mini pedestal attached to my TQ consistent of 1 nav radio and 1 com radio. These shall have multi functions and act as NAV1/2, ADF etc. Also transponder will be added. All panels will not be backlit due to cost and time. Instead I'll have a 12v led strip under the glare to light up the panels. Panels will be white 5mm acrylic painted in RAL7011 with a spraycan and then engraved using my cnc. Base will be in MDF. 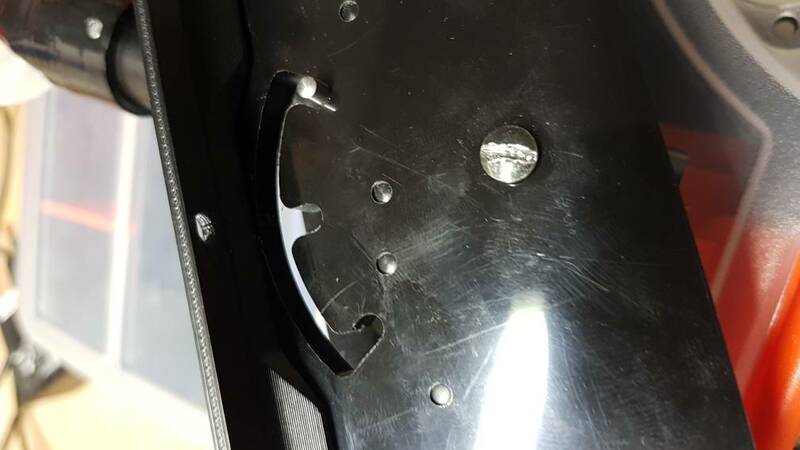 Backplate in 4mm clear acrylic painted in RAL7011. I'll only use one monitor, a 21.5" lcd. 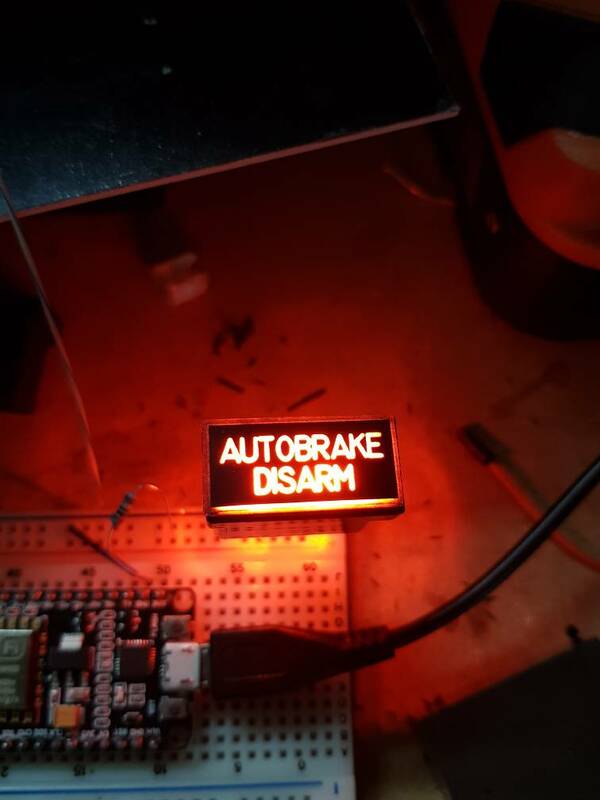 It Will display PFD/ND, clock and an custom made upper DU for engine monitoring. I'll use virtual 3d cockpit so I've also added some buttons to control the views. 4 buttons are still unassigned. Please come with ideas. One of them will be assigned to start pushback via plugin better pushback. By the way. All blue text is sketches to be engraved. Looks like a mess in the pictures but will be great on the panel. Please let me know what you think and if you have any advices for me. Remember, I don't strive to make it as real as possible. I'm trying to make a inexpensive but flyable Sim with minimal use of keyboard and mice. I'll add some pictures of what I've came up with until now. Selling "Hard-to-get" simparts like authentic Engine starters, Autobrake, IRS mode selectors and N1&SPD Ref Switches. Manufactured the gear lever today. It's not scale at all. It's much smaller than the real one. It would take to much space. 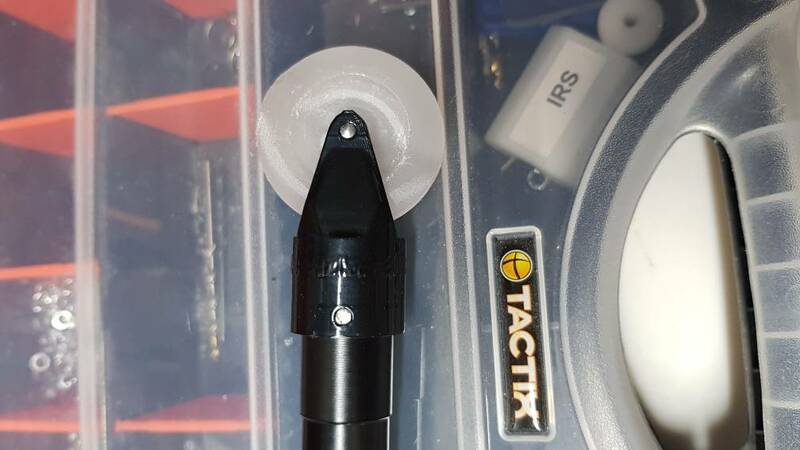 Attachment between shaft and gear knob is printed in Z-Ultrat. The rest is machines in CNC Mill and lathe. 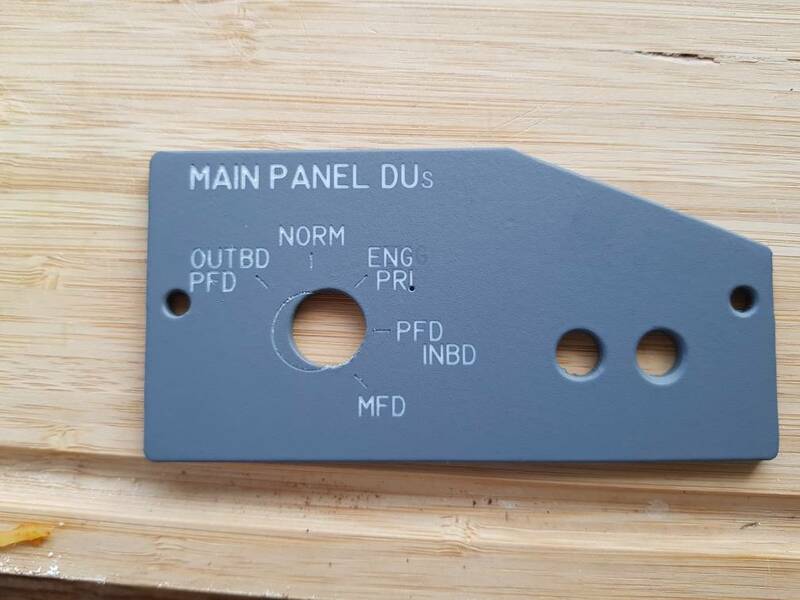 An printed annunciatorholder with FDS legend. 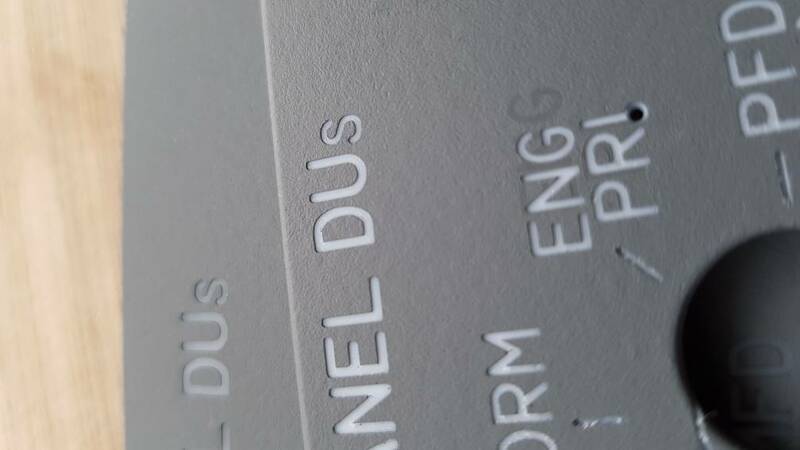 I'll make my own legends , this was just a try with my printed annunciator and diffuser cut from 5mm frosted acrylic. Looks great if you ask me. I use some wide angle 5mm flat top clear lens LEDs I found in my box. Really cool project! That Korry is looking really good, better than reproduction part i have seen yet. Today I received a teensy LC card and 10pcs of 8-bit shift registers, 74HC595. The purpose is mainly to evaluate teensy as I/O for this sim. Haven't decided yet if I wanna go with teensy or Arduino mega and Simvim. First thing I'll do is to play with the shift registers so see how I can work with multiplexing outputs. Step 2 will be multiplexing inputs. This works flawless in SimVim. SimVim has its limitations though. Just looking at your Gear lever Anders, did you print those side panels? they look too polished to be printed? It's only the gear knob and the part joining the shaft and gear knob that's printed. The remaining parts is machined out of POM. Very nice material to work with. I use an Zortrax M200 printer. That's an expensive printer you've got there, I assume the resolution is pretty high? I'm not familiar with POM, it looks a bit like the Acetal I use for machining. It's the same as acetal. Yes I'm happy with the printer but this is my first printer so I can't compare. Looking at pictures I believe it performs very well. Actually I think yours prints very well Joe. I've seen pictures of much cheaper prints to be both terrible and awesome. I think it also depends a lot on the user and model. It's the same with my printer, some models look stunning, some looks crappy. I guess some models are more printer friendly. 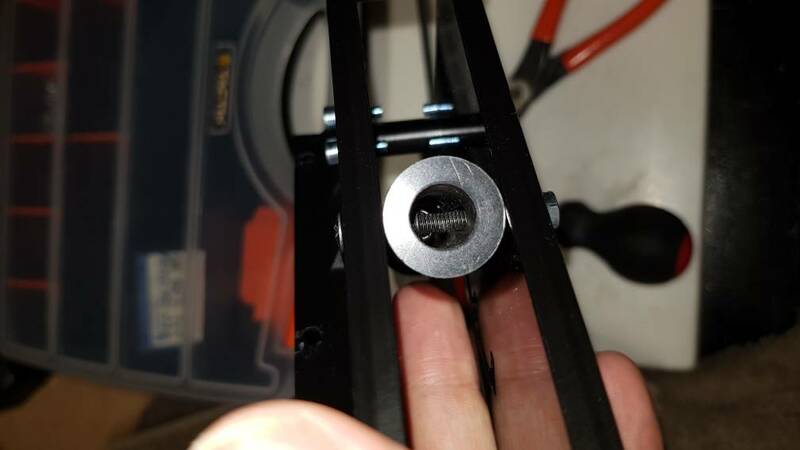 In my case smaller parts like 1x2cm start too look worse but if you print like 4 of them it looks better. I think it has to do with the temperature of the layers when applying next layer. Maybe a pause between layers would do it for smaller parts. 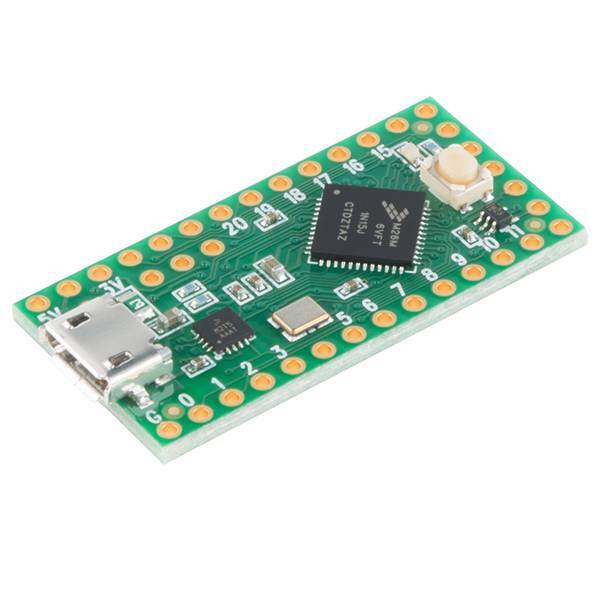 Anyone with knowledge about teensy LC or similar that can tell me if I would be able to power 8 annunciators from USB with teensy LC? My initial thought was to use a teensy 3.6 for the whole cockpit with multiplexing outputs and inputs and then put an Ethernet Jack on all panels and wire them to a big pcb with the teensy 3.6. 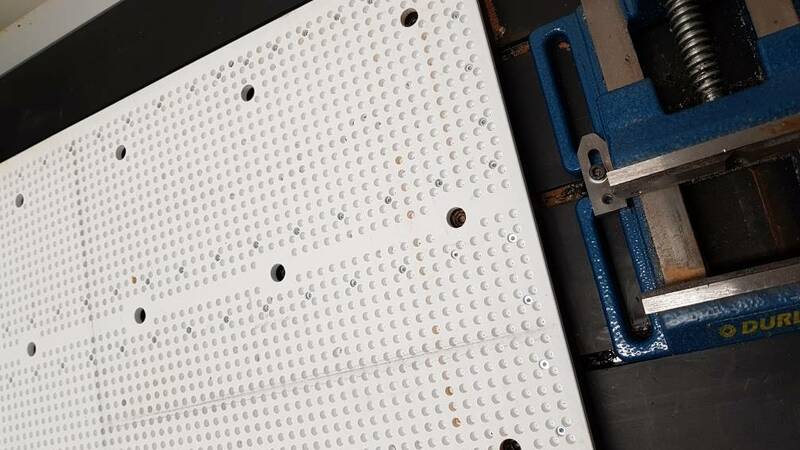 I believe that schematic will be quite complicated and also the Arduino code will be a real mess so my second thought is to use one teensy LC for each panel as kurt-olsson is doing in his build. What makes me nervous about that is it I'll be 10-12 USB devices instead of 1. I don't have good experience in using so many USB devices but maybe teensy is different? 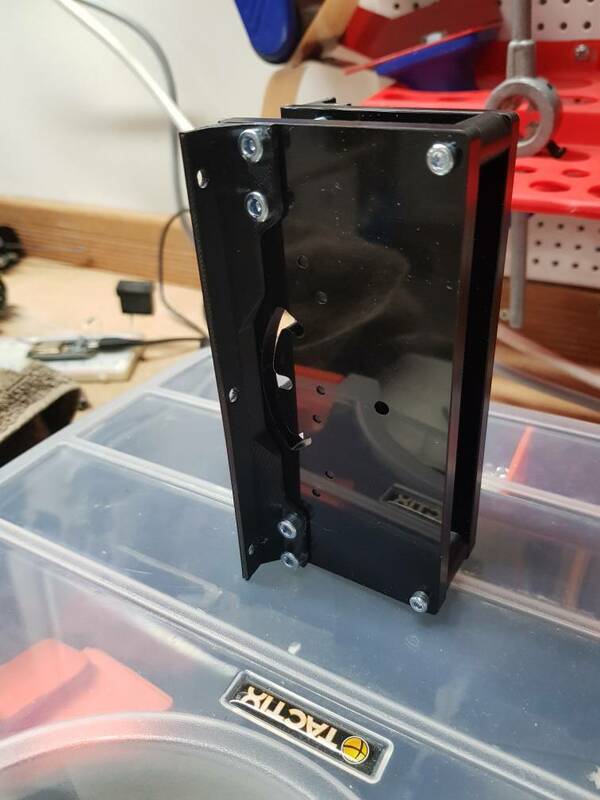 Also, if I were to use one teensy for each panel I really would like to run it on USB power so I don't have to run both USB and power to the panels. Somewhere I read USB can usually power 500mA and my calculations is that 8 annunciators at 2 LEDs each @ 20mA turns out to be 320mA. If that's the case it would work I guess but is there something I'm missing? Can the teensy handle 500mA? Can the multiplexer handle 500mA? It's the 74HC595. Teensy LC has 4 digital pins capable of higher 20 mA current. If loads requiring more current need to be driven, they should be connected to these 4 pins. 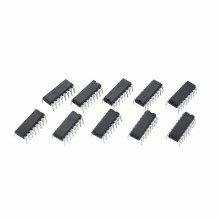 The special 5V buffer chip, which provides a copy of the signal at pin 17 amplified to 5V, is rated for 8 mA output. The other 23 digital pins are rated for 5 mA current. I've only used Arduinos and never Teensy's and Arduinos also have a total max current which cannot be exceeded although the max current per pin is still in limits. (Arduinos are much cheaper and I've never had a problem with Chinese clones, allowing the "magic smoke" to escape as I have done on a few occasions is therefore less of an issue). A Teensy per panel sounds easier and creates a modular system but when adding all the other USB devices for other panels, switches, yoke, rudder, keyboard, mouse etc you may soon be reaching Windows limits. There is a discussion elsewhere about the maximum number of USB devices and Windows seems to start giving errors long before it reaches the theoretical maximum. An option could be to use a few Teensy's as "hubs" which are connected to the PC and communicate with the other Teensy's through I2C or similar but that still doesn't solve the max current issue. Last few days I've been working with a PCB to house a teensy LC and 2 ULN2803A. 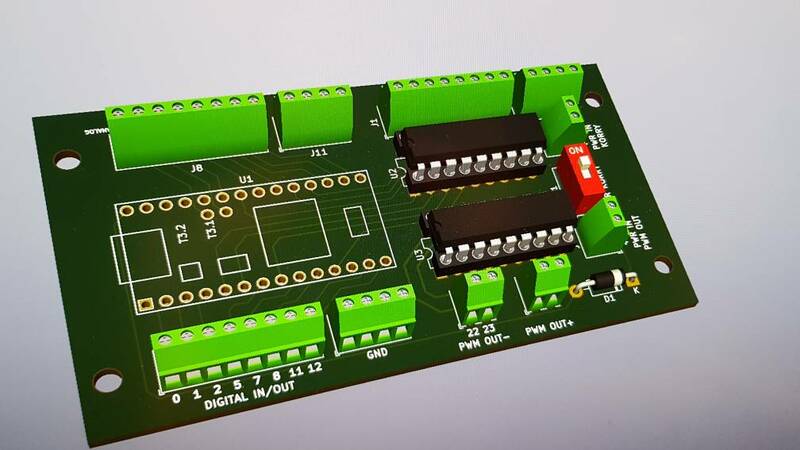 This is my first ever pcb. 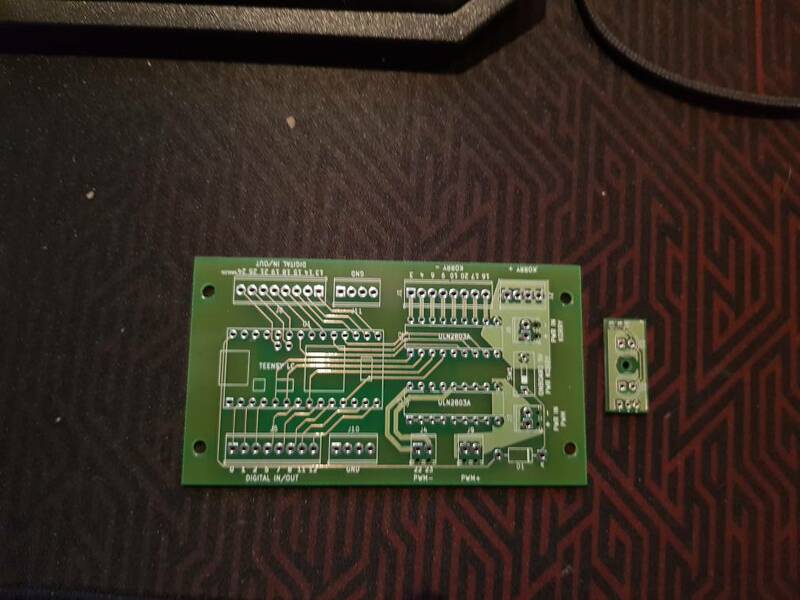 Never ever made a PCB before so all kind of good to knows are welcome before ordering them. What shall I think of? Most common error? What's not included in the picture is the teensy itself and the ULN chip will be mounted in a holder and not soldered directly onto the board. - With digital circuits, general rule to keep noise down is to have a ground plane on one side of the board and to try and keep as many traces as possible on the other side. - if there is a location that could just maybe, possibly need a capacitor or resistor, design it in. 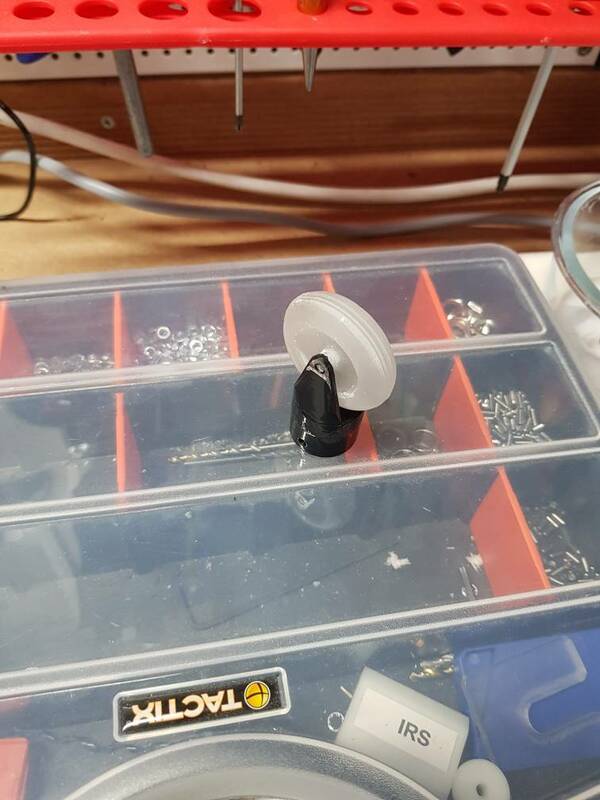 You can always leave the part off, or put in a 0 Ohm resistor, or solder a short across the pads. - Also with the above...don't forget locations for bypass capacitors. 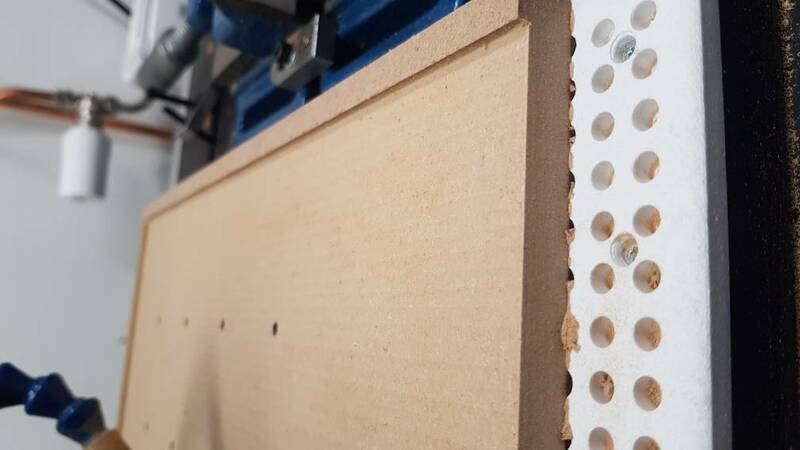 -Try to envision how you're going to wire to the connectors and how they will lead away from the board. Sometimes I'll add a pair of holes for a tie-wrap. Thank you for your input. 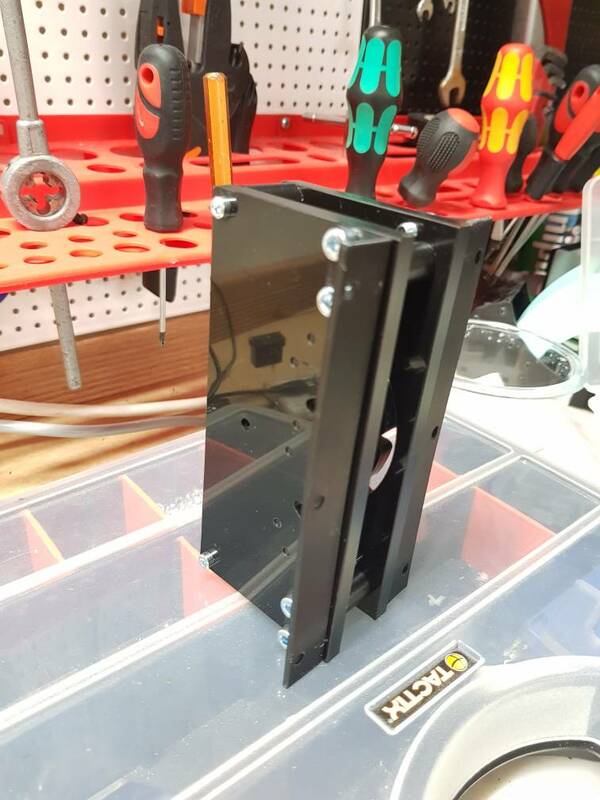 I've made a ground plane on the bottom layer. I've made a power plane for ,+24v and one for +5v on the upper layer. Is that a good approach or should I do traces from power connection ? They must withstand 2.5A so they get quite thick, that's why I did the zones instead. What do you think about that ? Still working on the PCB. 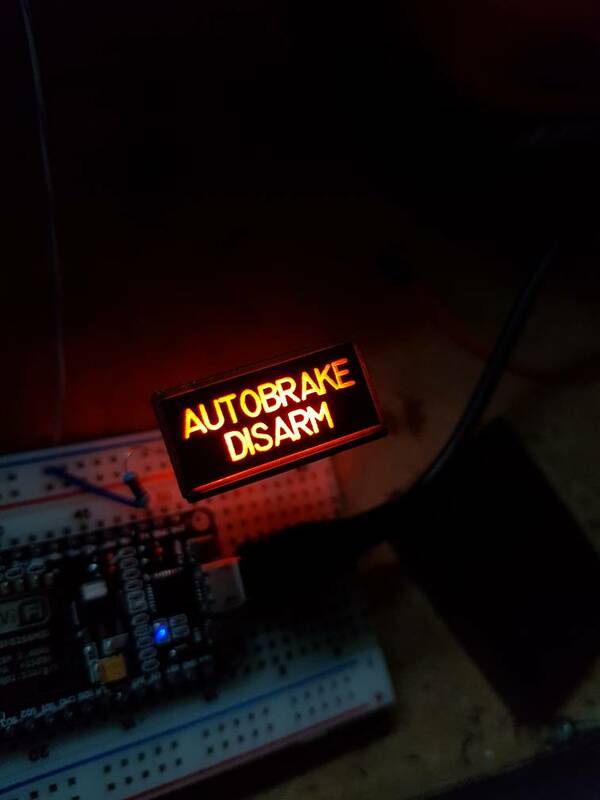 Probably ready to be manufactured within a couple of days. 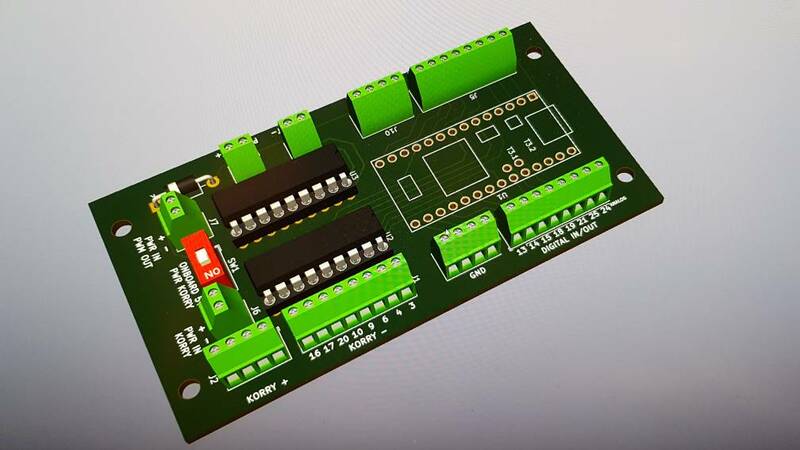 I and kurt-olsson use the same approach with teensyn, (I was inspired), so we have worked together on this PCB. Great fun to learn new stuff. 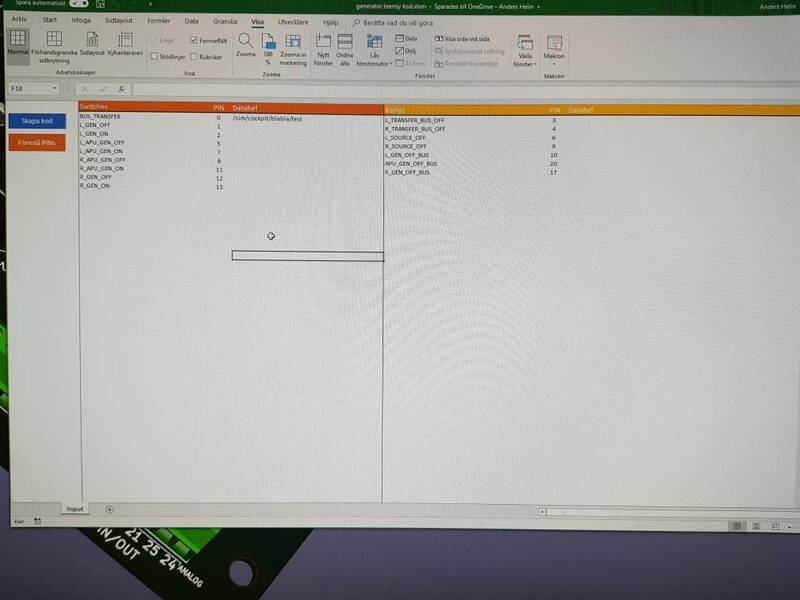 Tonight I also worked on an Excel tool that generates Arduino code for the teensy flightsim plugin. One-click and you have the complete code for the whole panel within a second. Took me 2hrs building it but will save lots of time for me. The code generated is more or less a copy of kurt-olsson's code he have posted here in to forum. I think you should be ok with either a power plane or traces in this application. There are trace size calculators online for determining the size of a trace for a given current. One other thing, any higher current switching traces, like those from a PWM on the 2803 out to a light bulb, will be where noise comes from. Keep those as short as you can to help prevent it from interfering. Thanks! They are shortest possible now with an increased track width. Doing lots of test how to make the panels. 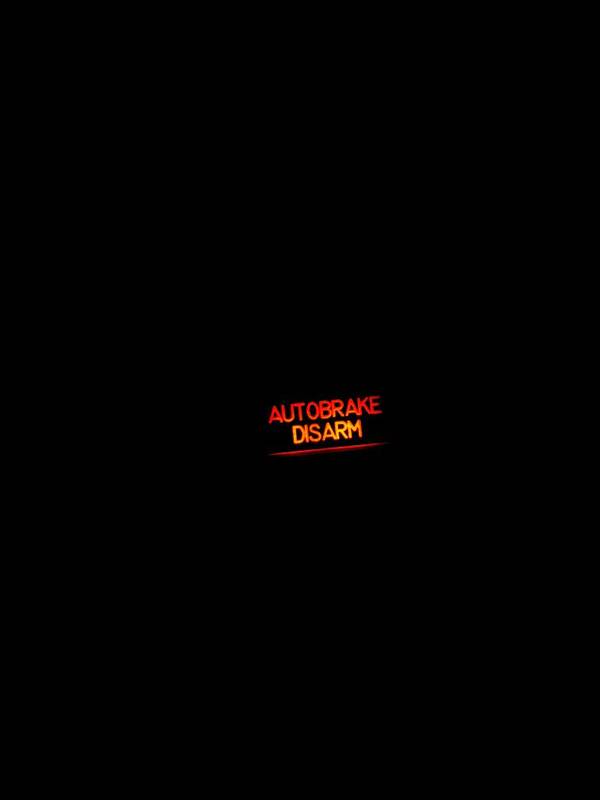 Any advice are very welcome. First test was with a white acrylic, didn't look good because it wasn't white enough, or actually I think it let through to much light so shadows appeared within the sheet. Second test is a clear acrylic glued to a thin white layer, much better. Something happened to .y machine loosing both Z (see deep hole) and also X & Y as you can see. Doesn't matter now when doing the tests but would be really boring on a real panel later on. Have no clue what happened. Next tests will be with variable depth. Also I've ordered a thicker engraving tool. Now I have to pocket out the characters. What depth do you use? 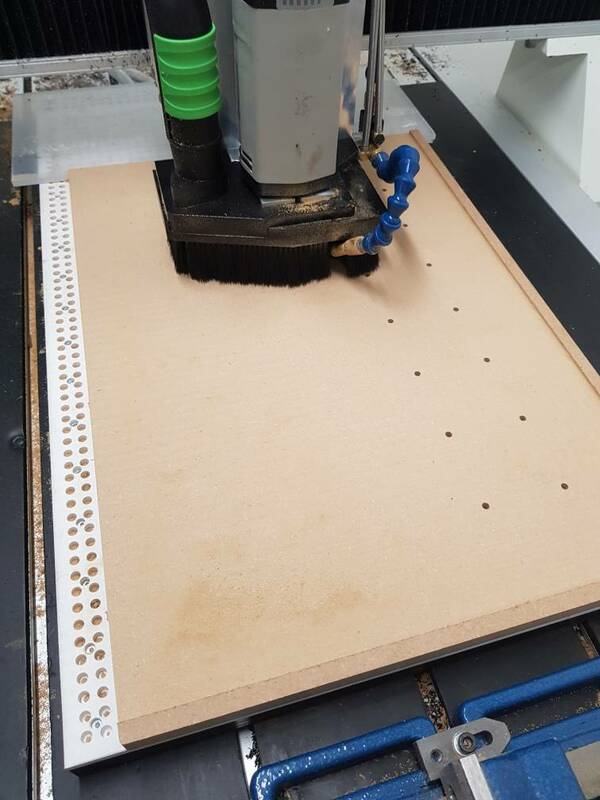 Preparing my CNC for panel-making. 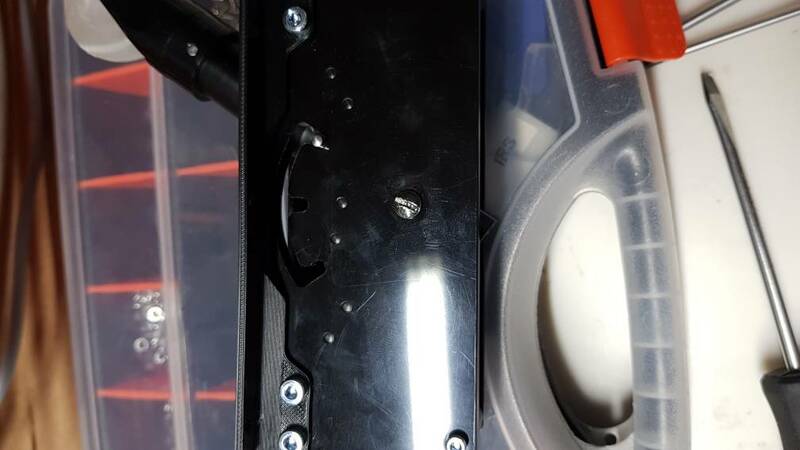 Using vacuum on so small pieces is not sufficient to hold the piece down and also finding X+Y 0 everytime is time-consuming. So I'm working on an panel-engravingbed in MDF. First of all I faced of 1.5mm on the bottom side and then drilled 4 alignment holes. 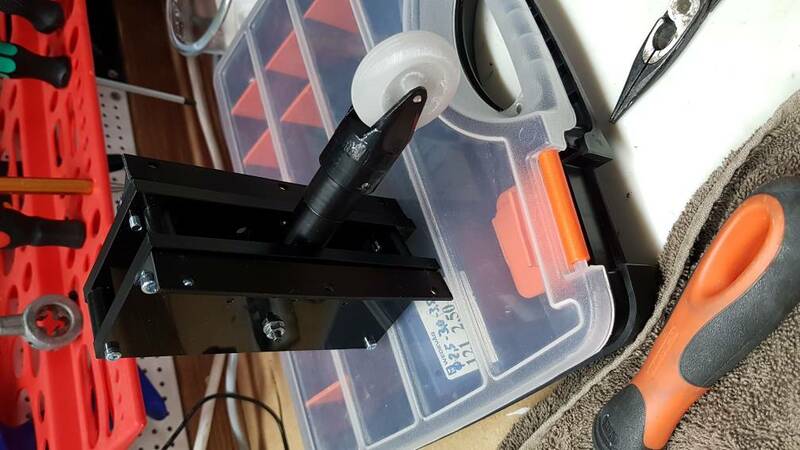 4 alignment pins was 3d printer with a small chamfer on the top to make it easier to fit into the table. On the upperside I'll face of 3mm but I'll save 10mm "wall" to align the panels against. Several M6 threads will be milled to allow fastening of the panels while engraving. 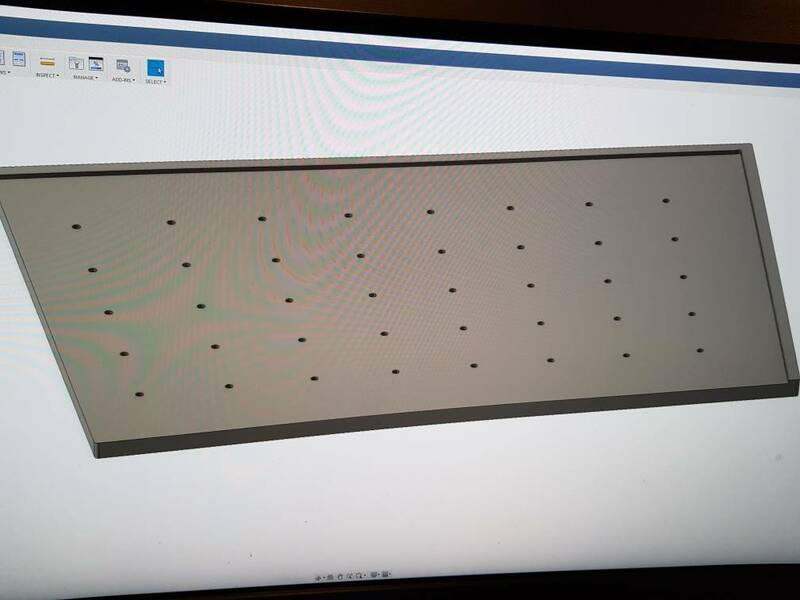 When I'm setting Y&X zero when milling the top side I'll save these coordinates and add 10mm to X and Y and then I have X&Y zero point for all engravings. Very convenient. The aligningpins allow me to remove the bed and reinstall it without loosing zeropoint. 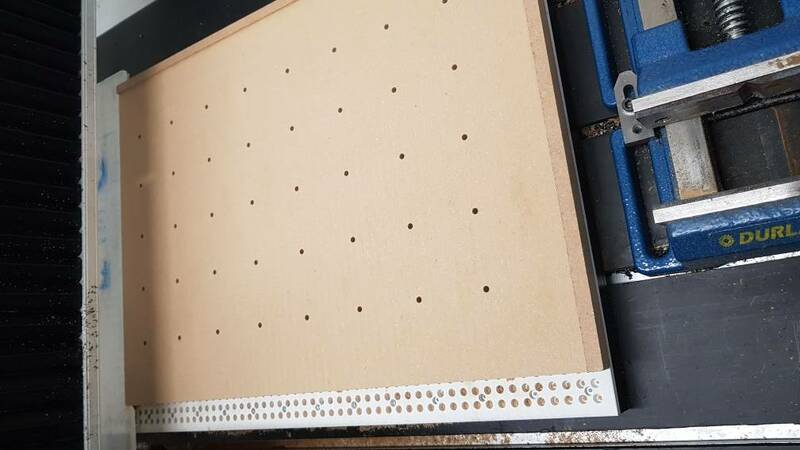 Since I faced off the bottom and removing 3mm on the top the bed will be extremely flat against Z so I'll probably be able to remove a very thin layer. Will mill the top part tomorrow. Family asleep now ? One thing I like to do when designing a circuit card that is going to have power inputs, is to add a small full-wave bridge rectifier (Or just 4 power diodes in a full-wave rectifier config) at the point where the power comes in. There's a tiny voltage drop using this method so it's always good to breadboard the design first. I do this to prevent accidental polarity reversal, which tends to release magic smoke. Didn't work out at all.. the MDF board looks like a banana in profile after today's milling. I'm going to make the exact same bed but in plastic next time. Need to order some plastic so it will not take place until next weekend at earliest. 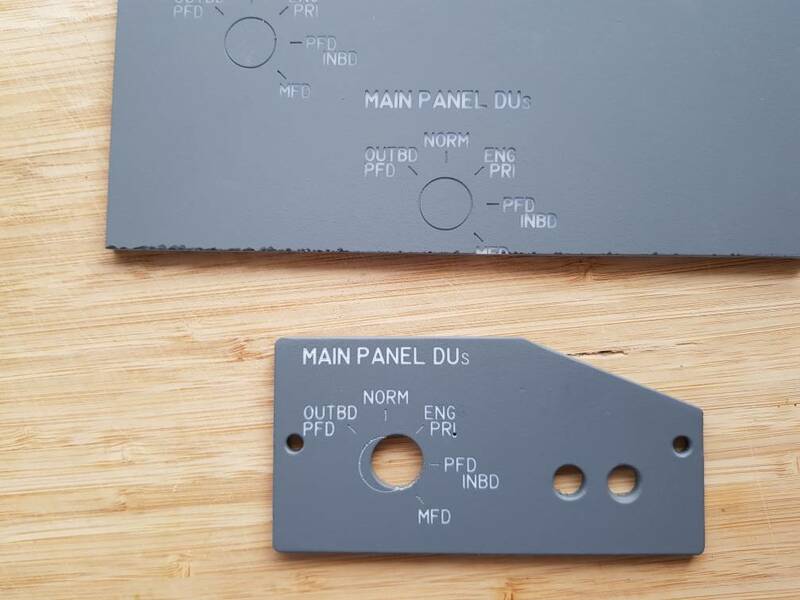 Today I received the PCB for each panel and korrys. Just ordered all electronics to populate the PCB. Very exciting to assemble and test the PCB. 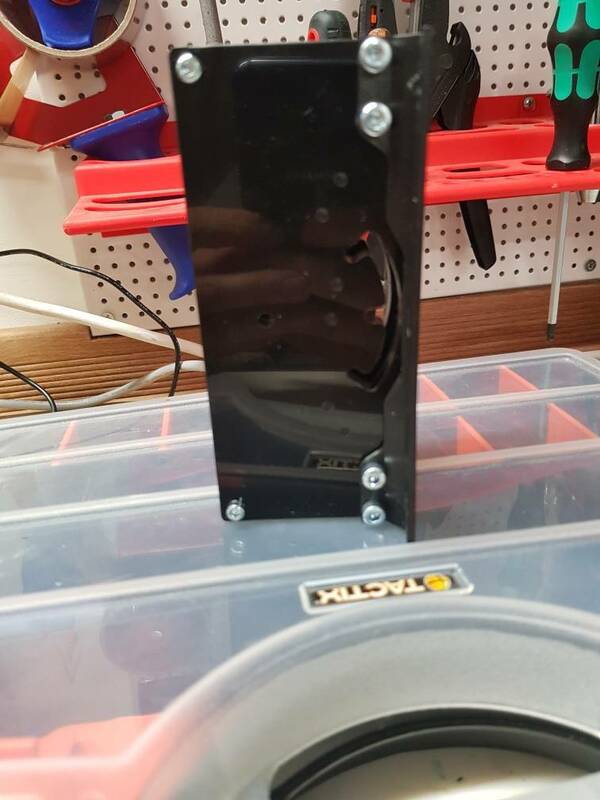 The korry PCB includes a smd resistor and 3pin connector. Also received a 15.4mm thick 700x400mm POM sheet to make a new engravingbed. Page created in 5.563 seconds with 25 queries.